The birth of the Olympus Mons boots and the memory of an alpine career from the crags to the Himalaya in winter. I was called in while the Olympus boot was being designed. My input was to work above all on its weight. And then, secondly, to concentrate on a different kind of inner boot so as to modulate the level of thermal protection depending on the needs and conditions of the climb. What I really asked for was obsessive attention to the weight and consequently also to the sole. The K2 model, which was one of the first prototypes, was built around a sort of base-upper shell to which the sole was anchored, on which the upper was then built around and consequently the true and proper boot. It was like a sort of bowl and inside it the boot would be stuck on and sewn, which personally I thought was too solid and heavy. Giuliano Jellici after receiving my indications got to work to devise something and make a boot which was even lighter. After a few months I reached Tesero to see the prototype and they showed me this boot which had a hand-made sole, in a brownish opaque colour, which wasn’t a real and proper sole but rather a trial version in extruded material which represented the outline of the sole which would then be produced in rubber by Vibram. The sole significantly affects the shoe’s weight and in terms of the shoes being made at that time it was the heaviest part of the boot. I picked up the boot to look at it, grabbing it by the gaiters, what happened next was that I picked it up easily because it was a lot lighter than any other high altitude boot I had ever picked up so far. I was enthusiastic. It was exactly what I was looking for. Even in terms of its sole, that solution was perfect for me. Jellici told me not to pay attention to the sole since this was only a fake prototype just made there and then to see the final effect of the shoe and that it would then be changed with one made of more solid material, thicker and therefore even heavier. I was about to leave for the winter expedition to Shishapangma and that boot was exactly what I wanted. I had to convince him to give it to me. I told Jellici that I was a bit sceptical, that during a Himalayan ascent the sole remains in contact with the bare ground, without crampons, only during very rare conditions. Basically, never. 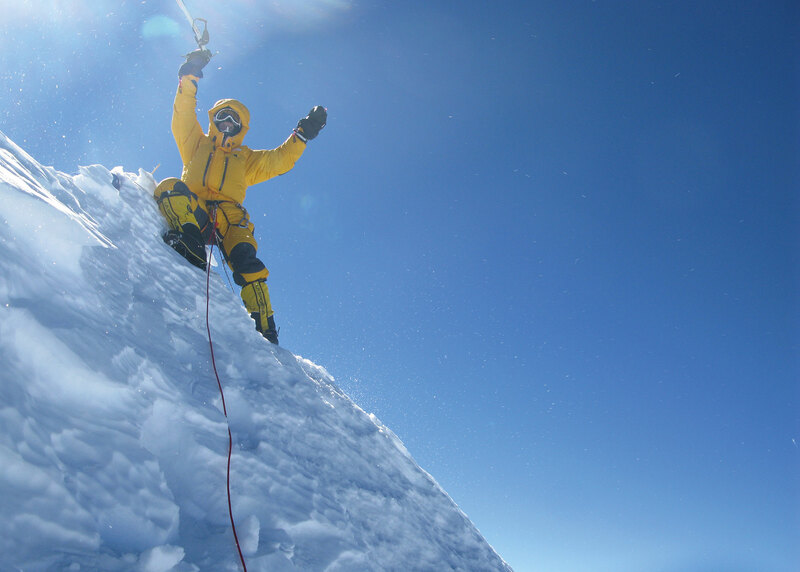 Apart from some sections of approach which can be easily avoided using other shoes, the high-altitude boot works well since almost all of the time it is used together with a crampon. The solution was to think of the boot and the boot’s sole - I had only just realised this - together with the crampons. Not as something on its own as we had done up to then. 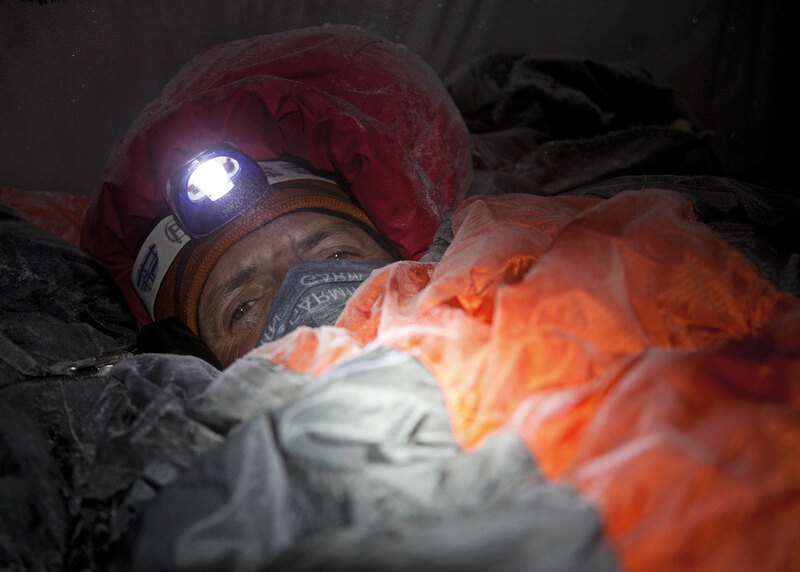 «When I climb up an 8000 metre peak, except for when I’m in the tent, I always wear my crampons», I made it clear to him. They were stunned, they had never thought of it in these terms. I also made him notice that the sole was the part of the shoe’s surface which was in contact with the snow most of the time and through which - due to the thermal bridge created by crampons - the greatest dispersion of heat occurred. The sample sole they were showing me probably was not very resistant to wear but it would appear that, with air trapped inside, it could isolate and retain the heat of the foot inside better than the other one. And then above all, it was damned light and I wanted it at all costs. What is used nowadays on all high-altitude shoes was born from this observation, from the wish to put that very lightweight prototype on my feet immediately and from the verification that in different parts of the sole different needs of resistance and wear were concentrated. The solution we use on all high-altitude shoes to this day, is to have different thicknesses and different materials in different areas of the sole. It was clear that the tip needed to be stronger, also in case one needed to climb some sections on rock, while the central portion of the sole concentrated on thermal isolation. It was a visionary choice which opened up a new way of considering shoes and which charted the way. It has to be said that at that time the most popular high-altitude shoes were in plastic, in that moment it was only a matter of choosing how to make the shoes but also ask oneself if it was reasonable to think of high-altitude shoes in the future without a plastic outer shell. The idea of not using plastic came from the double need of innovation while delving into one’s industrial know-how and to keeping the costs of the moulds down. It was the ability to avoid the obvious choices, which seemed obligatory at the time, that was La Sportiva’s trump card, as usual. nIt is transforming these limits into the project’s strengths that a series of shoes were created charting the way in the field of mountaineering. It is from then on and from those boots and those solutions that other models, ideal for use on the Alps or lower mountains, were developed. Nowadays high-altitude boots in plastic no longer exist. In this field, applying the La Sportiva method, this company has set an example and established a standard. My first sponsored contract came during the Sportroccia climbing competition in 1985 thanks to the Sciola sport shop, where I got my supplies and sometimes worked to earn some money. Camòs came with me to Tesero, in those days he was already part of the La Sportiva team. Francesco and Lorenzo welcomed me, father and son. One was the shadow of the other. Lorenzo accompanied Francesco in his every move and followed him everywhere he went inside the building. We went to the warehouse and I tried on a pair of Mariacher shoes, they had that blue spot, the first ones with the old logo. Then we climbed up to the office to sign the contract. Together with the two pairs of shoes every year, I would also get a pair of lycra tights, two sleeveless t-shirts - a yellow one and a purple one - and a sweatshirt. This gear could have been easily sent to the shop I worked for. It would have been easier and cheaper but I always tried, in every way possible, to personally go to the company to pick up my shoes and clothes. It would have been cheaper for me to go and buy that gear instead of going and coming back from Bergamo, where I lived, to pick it up. But I had the pleasure and gratification of receiving it directly from the hands of Francesco and Lorenzo every year. I also took into consideration the importance of being welcomed and listened to, for a few minutes. La Sportiva was the company for which Manolo and Mariacher worked, the great climbers of those years, Manolo especially was my hero. To me this meant, in a certain sense, being close to them, being part of their work and therefore indirectly receiving some attention which was not given to anyone and which was available only to a limited number of people. And I was among those people. My sponsor relationship continued with this series of pilgrimages to the company which became not only habit but also a ritual. I think that in 33 years of collaboration with La Sportiva I have had gear sent over to me at home only a few times, I have always tried to go personally and meet Francesco, Lorenzo, Jellici and all the people who work for the company. It is meeting up regularly and continuously which has made our relationship so special. My partnership with La Sportiva is based above all on friendship and on the personal relationship. The products and the success of the equipment which we have created together has been a consequence. It is incredible if I think about it, how in those days all you needed was a t-shirt and a pair of shoes to feel part of a world. Nowadays relationships and the way of thinking about sponsorships have changed, the way of presenting oneself has changed, but above all the way of dreaming by those looking for sponsorship has changed. In those days, what made me personally dream was the people and the care given: they listened to me. Not the money, not the gear. With La Sportiva the relationship has grown through the years, it has evolved, we have developed many revolutionary ideas and products together, but all of this has happened thanks to those human relations, and that relationship which was born back then. I must say it: my relationship with La Sportiva is something unique. Our contract is based on the values of times gone by. The Mega shoe is the tiniest shoe I have ever worn and used in my life, it was a shoe that was size 37.5, my size is 42.5. I remember that I got it widened and broken in by a friend who had a smaller foot. Shaping the shoe consisted in someone with a smaller foot, a friend or a girlfriend maybe, beginning to widen the shoe and shaping it by wearing it. After this initial breaking in phase, one started to wear the shoe and then finally you could use an extremely precise climbing shoe which fitted like a glove. It was crazy. Have you ever tried wearing a shoe which is five sizes smaller than your own. The idea we used to have on how a shoe should be used consisted of how you placed the sole’s edge and the shoe’s stiffness. The shoe’s stiffness though, lacking a midsole had to be made in relation to how compact the shoe was. In those days the concept of smearing the sole on foot holds still did not exist. The soles were sturdy, because they had to last over time, when they lost the edge’s corner and became rounded on the tip, they were ready to be changed. Then finer soles arrived, such as Kendo and consequently our footwork changed. The Mega shoe was connected to the image of Stefan Glowacz. The champion of all La Sportiva’s athletes, the true icon and my inspiration was - and still is, personally - Manolo. With Messner he is one of my two favourite legends of climbing and alpinism. Therefore when the Manolo rock shoe came out this shoe should have been the best shoe ever. The technological apex of La Sportiva’s products. 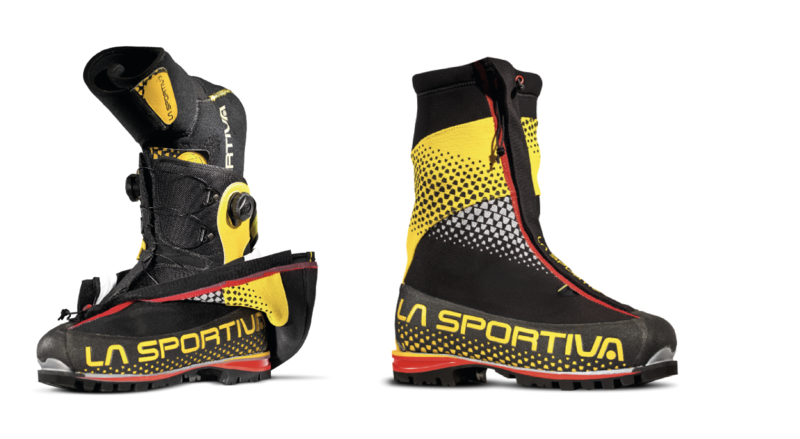 Instead that shoe, even if when designing it many ideas would then be developed successively, was probably one of the least successful projects by La Sportiva. It was an ambidextrous shoe, trying to solve the problem of the shoe’s tips which wore down and lost precision and in efficiency and therefore in a short time reduced the possibility of providing above average performances. Having an ambidextrous shoe, which could be worn both on the left and right foot, meant doubling its duration. The idea was interesting. Then the band pushed the heel forward, which was a brilliant idea. I remember seeing those shoes on Manolo’s feet, green, at the time I did not know that his prototypes were not ambidextrous like the shoes I was using. I had been given a pair of those shoes and to tell the truth I used them without ever swapping them. It was evident that they weren’t as good as the Mariacher shoes and that they did not work as efficiently but I continued to use them for quite a long time since they were called Manolo and because Manolo was my idol. It was that naïve side of my character, being a bit of a dreamer which pushed me to insist, trying to convince myself that the best climber of the La Sportiva Team had to by all means have the best shoe. I still have this characteristic and at the end of the day I find it funny and don’t deny it. In the end I have always been convinced that the difference between making it and not making it, had always something to do with the person, with the man. It could not depend on the shoe, it had to necessarily depend on me. I was the one who - eventually - had to compensate the difference and learn to do what Manolo did. In fact I hear people say that throughout my career, even when others considered the things I was trying to do as ridiculous or impossible, I have never stopped trying. And that is why in certain undertakings, I think I have made it. The Manolo shoe was an absurd shoe which had a soul and a dream, maybe the Manolo shoes did not help me climb a grade higher, but they contributed without a doubt to make me the person I am: a dreamer and an idealist. 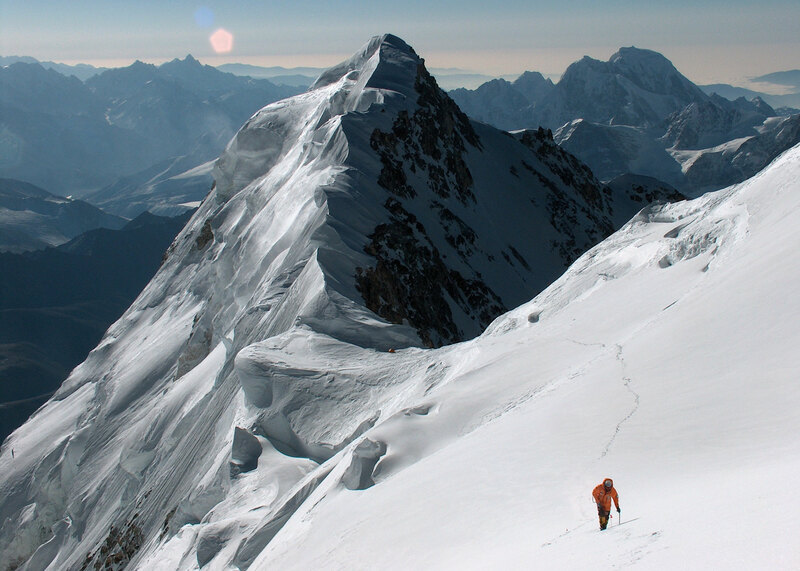 Developed together with the mountaineer Simone Moro, Gasherbrum 2 SM entails the most advanced technological progress insofar as shoemaking technique is concerned. The new model sports contained external volumes, even though it’s a high -mountain, double layer thermal boot, whose weight was reduced by 15% with regards to the previous version and becomes the absolute lightest in the category. It employes a new, highly insulating sole sporting recycled rubber.